I had last Friday afternoon free in Barcelona. As The Garb Wire’s editor-at-large, the afternoon was put to good use investigating the Catalonian capital’s more stylish quarters. Barcelona is a modern global city laced with impressive vestiges from the city’s origin as an ancient Roman stronghold. Now the cool kids occupy the old part of town. Neighbourhoods such as Barri Gòtic and El Born burst with boutiques and couture boltholes that sprout within the ancient stone frontages. It’s an exciting fusion of Gothic grandeur with budding art and fashion, which is overlaid with Gaudi’s magical and mosaic influence that seems to infuse everything in the city. The sculpture outside Hotel Arts resembled a huge golden wedge shoe from this angle. Mel had handed me a comprehensive list of things to investigate (see her previous post). I was motivated to get through her brief but the enchantment of these excellent neighbourhoods turned the prospect of progress instead into a beautiful meander (fortified by the discovery that Estrella Damm lager acts as a sort of sunscreen). But I still managed to do some good work. Commencing my investigations, my foot journey from the Segrada Familia to chic old parts of town took me down Passeig de Gràcia –a major prestige shopping avenue, and Barcelona’s equivalent to Rodeo Drive. The usual international (but uninteresting) fashion houses hunker down here, along with Barcelona’s own contribution to fast fashion’s world stage (think Desigual and Zara). This avenue is most memorable for its peppering of mind-bendingly good examples of Barcelona’s Modernista architectural style (more Gaudi abounds). My foot journey from the Segrada Familia to chic old parts of town took me down Passeig de Gràcia –a major prestige shopping avenue, and Barcelona’s equivalent to Rodeo Drive. I came across Aragaza nestled in between the tourist precinct’s ubiquitous ice cream shops. It’s a menswear label native to Barcelona, and they proudly state their clothing is designed and manufactured in the city. Their stuff achieves ruggedness and fine-detailed urbanity, and they appear to be known for their shirts, with their current line doing a nice job of imbuing cotton and linen pieces with well-placed explosions of pattern, such as paisley or watercolour brush-stroked plackets. I bought two and – while remaining untested – believe I can get away with wearing them at the beach as well as in the office. Mel’s brief, while comprehensive, actually largely converged into one stockist. OMG BCN is a cave of crafty wonders that’s hewn into one of Barcelona’s antiquated laneways. Iu and me bonding at OMG BCN. So many trinkets! OMG BCN is stocked with wares from local craftspeople, including excellent art and trinketry from Madrid artist Jose Aroda (pop art inspired ceramics and images), The Wandering Orion (whimsical statements on pennants), Matímañana (probably the best caffeine-wear in the world) and Emian Böhe (exquisite shades that hopefully help to finally wean us off our lust for bulky resin frames). Iu was the man running the show that day – he appeared to be expecting me (Mel strikes again with those far reaching social skills). Both Iu and Estelle were gracious in their hosting, with Iu scurrying between shop floor and storeroom to fetch more things to fuel my excitement. 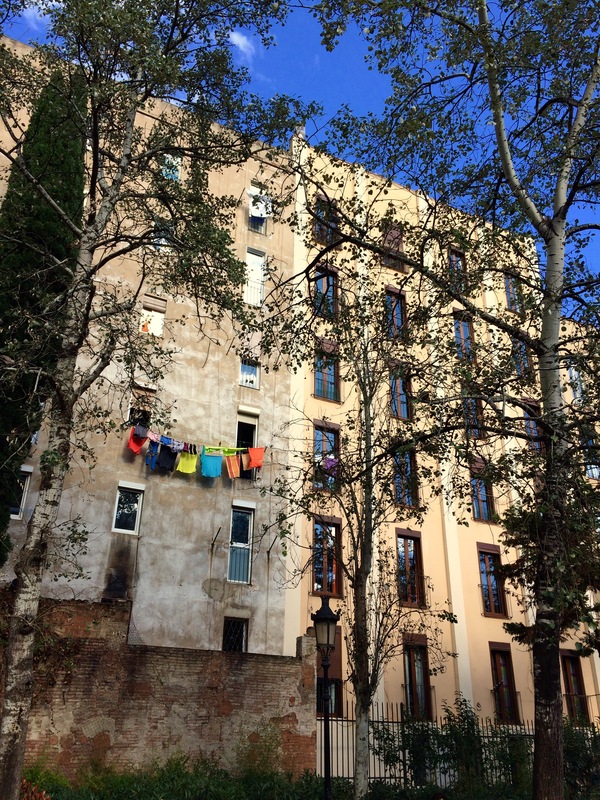 While I didn’t manage to accomplish anywhere near the entirety of Mel’s brief, my experiences in between her listed treasures left me with the impression that Barcelona can be counted on to arouse both culture and cool, and often together.